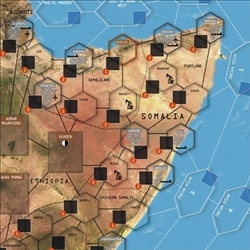 Somali Pirates, designed by Joseph Miranda, is a wargame set in a hypothetical Coalition campaign to destroy the power of pirates based in Somalia, as well as to otherwise gain control of that country. The assumption of the game is that the pirates, in league with local warlords and Al Qaeda, have become strong enough to be an even bigger threat to the region than they are now. In response, various powers launch military action against them. There are two players in Somali Pirates: The Coalition, who wants to destroy the pirates, and the Pirates, who want to survive, as well as to maximize their own power and wealth. Central to play of the game is the Netwar Index. Each player has a Netwar Index that indicates how successful he is in achieving his goals...effectively, representing the amount of public support that each side is getting. The Netwar Index affects various aspects of the game, such as mobilization of reinforcements, and is also part of gaining victory. 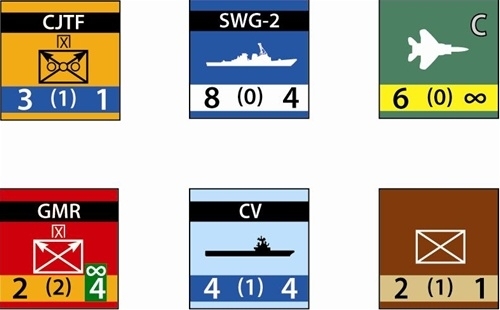 Both players have a set of counters that represent their naval, land, air and special operations forces (SOF). Players move their pieces across the spaces on the map and engage in various kinds of conflict in order to destroy enemy forces, seize critical geographical regions, and change the Netwar Index (hopefully in their favor). Both sides can mobilize new units by paying for them with Netwar Points. Given the asymmetry of the situation, each side in the game will have several unique rules.. 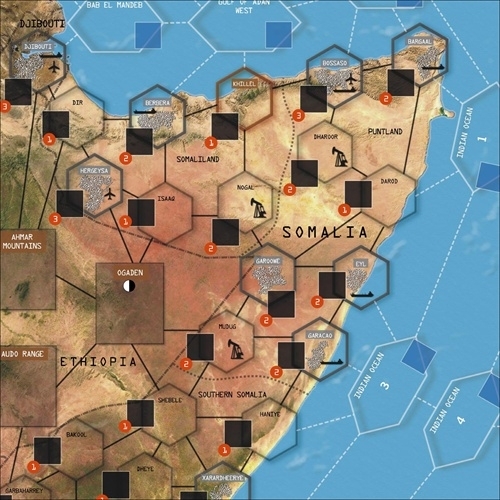 The game includes one map of East Africa and environs, from the Red Sea to the Indian Ocean, and one counter-sheet (228 counters) representing various pirate and Al Qaeda forces, local militias and warlords, plus the principle Coalition forces (primarily NATO and the United States, and even a potential inclusion of a Chinese expeditionary force).